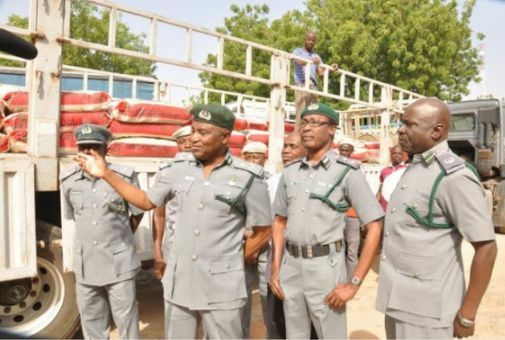 The Nigeria Customs Service (NCS), Sokoto Command, comprising Zamfara, Sokoto and Kebbi States, warned rice smugglers to steer clear of the zone or face the wrath of the law. The controller gave the warning following the seizure of 300 bags of foreign rice concealed in 350 locally made rice bags along Sokoto/Gusau road. Speaking with journalists in Sokoto on Monday, the Customs Area Controller of the Command, Mr. Nasir Ahmad, who expressed dismay that the menace of smuggling was being perpetrated by people in Sokoto and Kebbi States, described their action as economic sabotage which is detrimental to the efforts of the federal government to boost rice farming in the country. “It is just unfortunate that this smuggling of contraband is done by people from this area. Why are they killing rice milling in this zone? The federal government is trying to encourage local production of rice so that we can have self sufficiency and conserve foreign exchange. We have WACOT and Labana rice mills in Kebbi State. “So, there is no hiding place for rice smugglers in this zone. They should go back to farm and engage in commercial farming. Whatever tricks they use, we will combat them because we have zero tolerance for smuggling in this zone,” he stated.